As 2016 winds down, we remember a year of triumph and tragedy, where teams made history, blazed new trails, and followed familiar ones. And when one school faced unimaginable tragedy, another school, and an entire community, rallied to help mourn, comfort and support. At Randolph-Macon, three teams took center stage in 2016, beginning with baseball, as a talented senior class helped lead the Yellow Jackets to the most successful season in program history. Their 35-8-1 record included an Old Dominion Athletic Conference (ODAC) Championship after defeating rival Hampden-Sydney in the tournament final, the school's first-ever win in an NCAA Tournament, as the Yellow Jackets advanced all the way to the Mideast Regional Championship game, and, for the Class of 2016, 108 wins in their four-year tenure at Hugh Stephens Field at Estes Park, becoming the first class to win 100 games for Randolph-Macon. In the fall, the volleyball team, despite losing a talented senior class of their own, loaded up on freshmen, teamed with returning standouts Samantha Sallade, Erin Quinn, Mariah Clark and Colleen Beaver, and successfully defended their ODAC Championship, sweeping the conference in both the regular season and tournament and clinching another bid to the NCAA Tournament. Perhaps the biggest surprise of 2016 came at Day Field, where Randolph-Macon football, coming off a 4-6 season in 2015 and picked to finish tied for fifth in the ODAC, became only the second team in program history to win nine games in a season. Behind an historically stingy defense and the rushing attack of sophomore Tre Frederick, the Yellow Jackets won the ODAC Championship for the first time since 2008 with a 6-1 conference record and a 9-1 mark overall, qualifying for the NCAA Tournament, seeing their season conclude in Baltimore with a first round loss to Johns Hopkins. Head Coach Pedro Arruza won Virginia State Coach of The Year, College Division, from the Virginia Sports Information Directors, while five players earned First Team honors, including Frederick, defensive standouts Eric Long and Cole Burdette. offensive lineman Greg Castle and kicker Seth Yurgel. On the softball field, Patrick Henry graduate, and now Randolph-Macon alumnus Madison Gilman, made history, becoming the first Yellow Jacket softball player ever to earn an All-American honor, named to two separate teams after leading the Yellow Jackets to 117 wins over four years, the most in a four-year period in program history, which included the team's first ODAC Championship in 2015. 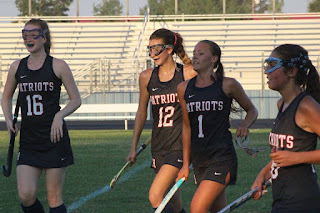 At Patrick Henry, it was a fall season to remember, as the best autumn for the Patriots in many years was capped off by the school's first team state championship in any sport in 22 years. The young guns of Patriot boys volleyball, after losing to county rival Atlee in the regular season and conference playoffs, found the formula to besting the Raiders, winning in the sectional tournament to clinch not only a 5A State Tournament bid, but a home game in the state semifinals, where Patrick Henry rallied to beat Maury in five sets. 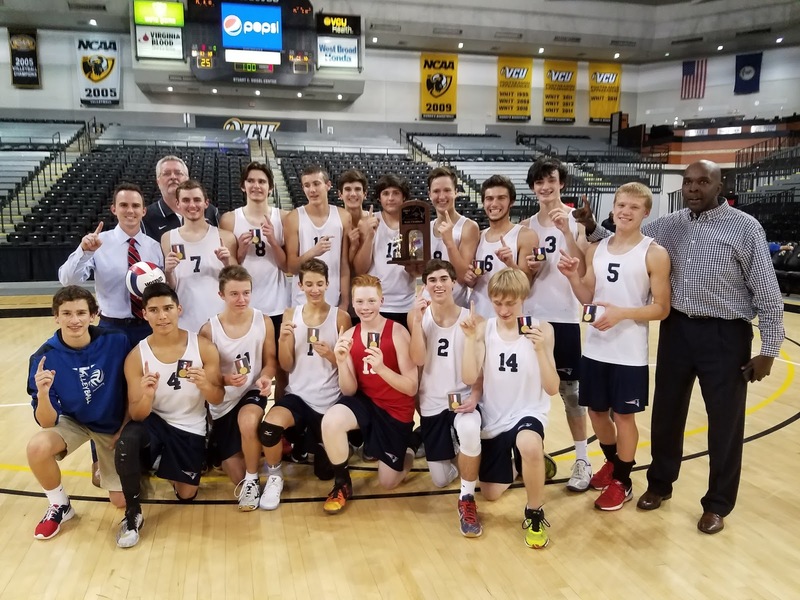 Facing multiple-time defending state champion Princess Anne in the championship, Patrick Henry overpowered their opponents, winning the title in a three-set sweep. Joining boys volleyball with successful seasons were field hockey, who, too, found a way to beat Atlee for the first time, which clinched an historic berth to the 5A North Region Tournament for the Patriots, a program that struggled to win a match just a few years ago. 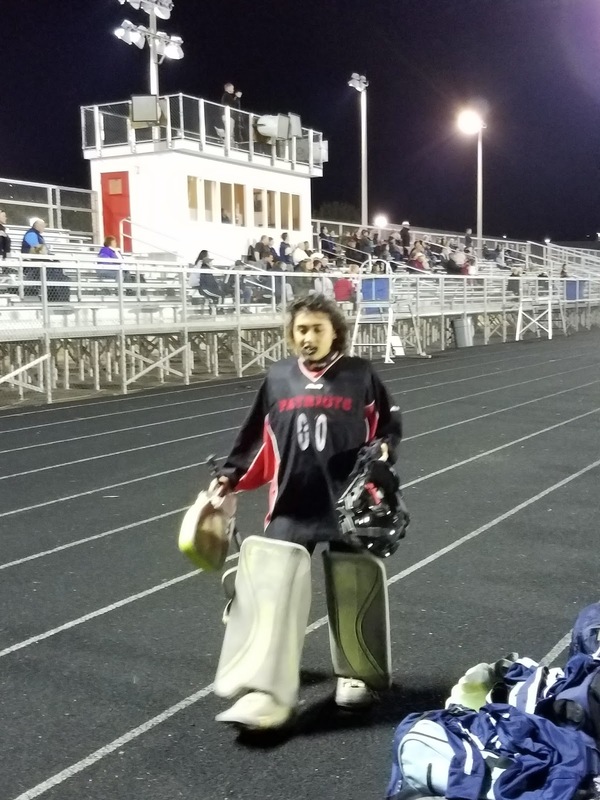 Midfielder Aidan Rossman and goalkeeper Taqiyah Chernesky each earned Second Team Group 5A All-State Honors from the Virginia High School League (VHSL). On the gridiron, Patrick Henry defeated county rivals Hanover and Atlee for the first time since 2006 and 2008 respectively en route to an 8-4 season that included both their first playoff win since 2007 and first playoff home game since 2001. Raider Nation had plenty to cheer about at Atlee, a school which experienced new beginnings and familiar travels. The spring was dominated by both softball and boys lacrosse, as both teams sought a return to Fairfax and their respective 5A State Tournaments. 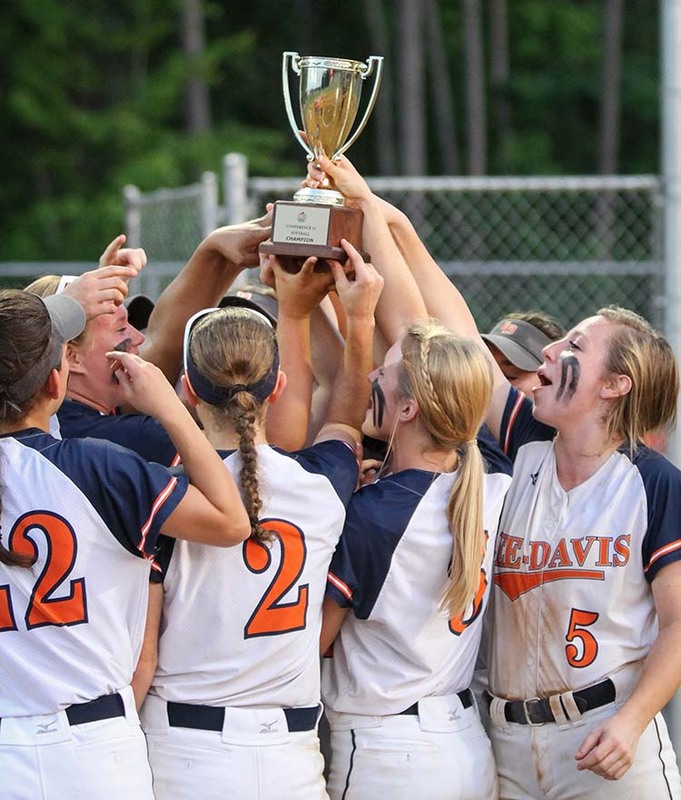 For softball, a deeply experienced team found its biggest challenge right down the street as Atlee and Lee-Davis battled first for county supremacy, then, after each advanced through their respective conference and region tournaments in dramatic fashion, the Raiders and Confederates found themselves paired in one 5A State Semifinal June 10th. 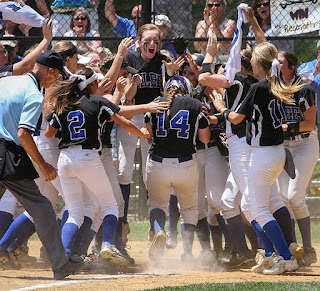 Using their experience from the 2015 championship run to its highest potential, Atlee powered past Lee-Davis on the strength of three-run home runs by Raine Wilson and Casey Barrett, then used a Barrett home run the next day to spark a 5-0 win over Hickory, the same time they defeated a year earlier in the finals, to repeat as 5A State Champions. On the same weekend just three miles away, Atlee boys lacrosse looked to erase the disappointment of a state final defeat in 2015, and had a chance to win early in overtime against Briar Woods. But the Raiders shot failed, and Briar Woods found the back of the net, and Atlee settled for runner-up status again in a 9-8 loss that saw the Raiders for overtime with two goals in the final minutes of regulation. The Atlee Football Experience gained a new leader, as Matt Gray moved from the Randolph-Macon coaching staff to take the helm of the Raiders, who won five games and clinched a postseason berth in Gray's inaugural season. 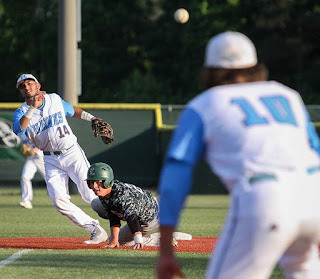 The road well traveled was also a theme at Hanover High School, as the baseball team, absolutely loaded with talented arms on the mound, went through 2016 without losing a game in the Commonwealth of Virginia. The Hawks took a 23-1 record into their June 11th 4A State Championship Game against Liberty Christian confident of winning their third state title in a four-year span, but having no idea what it would take on that hot, humid afternoon to accomplish it. Leading 7-1 after five innings and beginning to taste another trophy, Hanover watched in shock as Liberty Christian pounded the usually reliable pitching staff for eight runs in the sixth inning to take a 9-7 lead. "Nothing was going right in the top of the sixth, but we had to keep our composure and mentality," recalled then-senior starter Grey Lyttle. The Hawks proceeded to compose a six-run sixth inning rally of their own to retake the lead at 13-9, then hold on in the seventh as Tyler Morgan, who couldn't pitch a year earlier due to arm surgery, got the final strikeout to preserve a wild 13-12 victory and another Hanover state title. Also in the spring, the Hanover boys lacrosse team tasted June lacrosse for the first time, advancing to both the 4A South Region Final and the 4A State Tournament for the very first time. Individually, Hanover girls soccer player Sabrina Hernandez made history, too, as the rising senior played for the United State Women's Deaf Soccer Team as they swept to victory in the 2016 Deaf World Cup played in Italy. Hernandez, who was also a member of the 2013 gold-medal team at the Deaflympics, scored her first international goal in a 4-1 win over Poland. 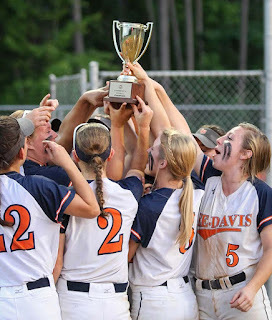 At Lee-Davis, softball certainly made their mark, qualifying for the state tournament for the first time since winning it all in 2011, while in February, Hayden Keener became the only state individual wrestling champion from Hanover County, capturing the 5A State Championship at 120 pounds with a 6-3 win over Kaz Gootee of Massaponax. 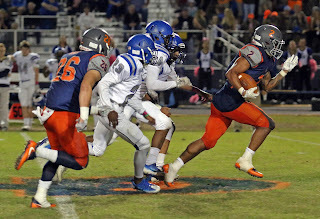 Lee-Davis football continued to rebuild the winning tradition with an 8-2 regular season which included sweeping their three county rivals, winning the mythical county championship with a 14-7 Tomato Bowl triumph at Patrick Henry November 4th. Swimmer Molly Sheffield repeated as a 5A State Champion for Lee-Davis, as did Ted Schubert for Patrick Henry and Olivia Fisher for Atlee. Sheffield and Schubert spent a portion of their summers competing at the U.S. Olympic Team Trials in Omaha. But 2016 will perhaps be best remembered for how the Confederates responded to the tragic events of April 23rd, when senior, and football player, Dylan Ballard was killed in an automobile accident along with 2011 Lee-Davis graduate Elliott Hinton. 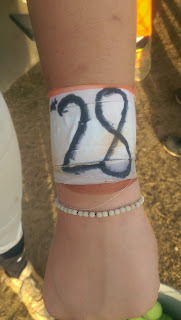 Immediately, Dylan's uniform number, #28, could be seen everywhere on campus, painted on fields, written on wrist tape by softball players. Six nights later, when rival Atlee came to Lee-Davis for baseball, softball and soccer games, the usual "Rivalry Night" became a night for compassion, grieving, and learning. Atlee's softball team presented Lee-Davis' squad with a huge banner signed by Raider students supporting the Confederate student body, while wearing orange ribbons in their hair, a nod to a Lee-Davis color. Then, as sports has done countless times, three games across the Lee-Davis complex began a healing process that continues as 2017 draws near, reminding Hanover County that, no matter how much fun we derive from the games people play, and the in-county rivalries that exist, we are at our best when we are together, rising above the challenges that real life can provide. LISTEN LIVE: Times-Dispatch Invitational Tournament Championship Monday! The RVA Sports Network is proud to bring you a quadruple-header of games from Championship Monday of the 22nd Annual Times-Dispatch Invitational Tournament live from the Richmond Coliseum! CLICK HERE or click below on the embedded YouTube page to listen, starting at 3:30pm, to the Boys and Girls Championship and 3rd Place games only from The RVA Sports Network! You can also listen by clicking the link below. For complete #TDIT information download the #TDIT free app now on Google Play or the Apple Store, where you see schedules, locations, times, can buy tickets and more! Riley Starcher (Grassfield) 42-14, So. over Joseph McMillin (Powhatan) 28-15, So. (Dec 7-4). Kevin Velez (Clover Hill) 26-10, So. over Bruno Alveres (Brooke Point) 4-2, Fr. (Fall 4:44). Cameron Chicella (Ocean Lakes) 15-22, So. over Cole Gorvett (Westfield) 2-3, Fr. (For.). Will Lisenby (Westfield) 3-0, Jr. over Evan Buchanan (Atlee) 3-1, Fr. (SV-1 9-7). Carson Tinsley (Mills Godwin) 31-9, Sr. over Elijah Jordan (Powhatan) 38-14, Sr. (Fall 3:29). Jordan Smith (Hanover) 21-18, So. over Justus Jones (Brooke Point) 21-12, Sr. (Dec 5-3). Bobby Quinones (Westfield) 5-0, Jr. over Josh Montague (Brooke Point) 20-13, Jr. (Fall 5:43). Brycen Martz (Ocean Lakes) 28-17, Sr. over Jacob Mills (Grassfield) 36-20, Sr. (Dec 13-12). Mariano Hornedo (Atlee) 44-20, Sr. over Anthony Commuzi (Atlee) 36-18, Jr. (Fall 3:22). Aaron Freidhof (Prince George) 4-0, Sr. over Sam Slate (Benedictine) 7-2, Fr. (Fall 1:46). Brandon Bye (Millbrook) 5-1, Sr. over Josh Epperly (Hanover) 3-2, Fr. (Fall 3:51). Brenden Lugo (Grassfield) 18-6, Sr. over Brett Reid (Douglas Freeman) 14-13, Sr. (Fall 1:50). Collin Gerardi (Powhatan) 44-6, Jr. over Zachary Gillette (Grassfield) 47-10, Sr. (Fall 1:40). Joseph Knight (Brooke Point) 32-4, Sr. over Nate Hackman (Ocean Lakes) 34-15, Sr. (Fall 2:10). Caleb Bland (Hermitage) 31-10, Sr. over Oleg Johnson (Westfield) 4-3, So. (Dec 6-5). Aidan Murphy (Ocean Lakes) 5-0, Sr. over Garrett Plummer (Lee Davis) 38-14, Sr. (Fall 1:55). Michael Dew (Glen Allen) 35-10, Jr. over Daniel Goodwin (Grassfield) 44-17, Sr. (Dec 6-3). David Hoover (Hanover) 24-13, Jr. over Eric Hogge (Midlothian) 24-11, Sr. (Dec 11-10). Jeffrey Hoyt (Powhatan) 24-20, Jr. over Jonathon Conrad (Lee Davis) 35-8, Jr. (Fall 3:21). Ian Baker (Monacan) 34-7, Jr. over AJ Deutel (Brooke Point) 14-7, Sr. (Inj. 0:00). Ben Hillard (Ocean Lakes) 8-8, Jr. over Sebastian Cobb (Hanover) 5-3, Jr. (Fall 3:37). Carson Allen (Hanover) 36-9, Jr. over Fisher Evans (Lee Davis) 46-12, Jr. (Fall 3:19). Samuel Tomlinson (Powhatan) 32-14, Jr. over Braxton Fell (Grafton) 3-2, Sr. (Dec 9-4). Ibram Bector (Hermitage) 27-12, Jr. over Cal Cochran (Westfield) 22-28, Jr. (Fall 2:27). Alex Britto (Collegiate) 34-14, Sr. over Andy Aldridge (Lee Davis) 3-1, Fr. (Inj. 0:00). Jacob Kennedy (Prince George) 5-1, Jr. over Austin Pitts (Mills Godwin) 28-17, So. (Fall 0:58). Jack Drimer (Mills Godwin) 5-2, Jr. over Jeremiah Vivero (Grafton) 3-3, Sr. (Dec 4-3). Andrew Anthony (Lee Davis) 33-9, Sr. over Xever Lemieux (Millbrook) 6-8, Jr. (Dec 3-2). Wallace Canada (Prince George) 4-1, So. over Will Sayegh (Midlothian) 26-8, Jr. (Inj. 0:00). Cohen Call (Atlee) 36-18, Jr. over Logan Pettorini (Brooke Point) 13-9, Sr. (Fall 3:51). Stephen Burrell (Grassfield) 47-11, Sr. over Edward `Ned` Anthony (Lee Davis) 42-7, Jr. (Dec 9-5). Jacob Sinsel (Ocean Lakes) 34-15, Sr. over Gabe Neaverth (Millbrook) 22-19, Sr. (Fall 1:39). Luke Armstrong (Grafton) 4-2, Sr. over Brandon Whitton (Westfield) 26-22, Sr. (Dec 10-4). Cody Roundtree (Clover Hill) 31-10, Sr. over Martiese Phipps (Monacan) 17-12, Jr. (Dec 6-5). Fabrizio Lazo (Westfield) 20-15, Jr. over Hunter Beck (Lee Davis) 3-2, Jr. (MD 8-0). Emanuel Torres (Hermitage) 3-2, Fr. over Austin Yogi (Amelia) 15-19, Sr. (For.). Yates Carrier (Ocean Lakes) 4-0, Sr. over Sari Maksad (Lee Davis) 25-15, Sr. (Fall 1:02). Xavier Brown (Monacan) 25-16, Sr. over Jackson Burkey (Clover Hill) 3-2, So. (Fall 0:47). Zeke Elswick (Mills Godwin) 3-2, Jr. over James Walters (Deep Run) 2-3, Jr. (Fall 1:48). Trevor Burns (Grassfield) 39-11, Jr. over Ramses Montalvo (Brooke Point) 17-6, Jr. (SV-1 4-2). Justin Spencer (Mills Godwin) 19-3, Sr. over Robbie Adelstein (Atlee) 21-10, Jr. (Dec 3-2). Tavon Blowe (Millbrook) 19-15, Jr. over Jack Oppenheim (Deep Run) 3-3, Sr. (Dec 5-4). The 2016 Old Dominion Athletic Conference football champion Randolph-Macon Yellow Jackets have swept the top All-ODAC awards announced Tuesday by the league office. Sophomore tailback Tre Frederick, who rushed for 1,387 yards and eleven touchdowns, both ODAC-best figures, was named the ODAC Offensive Player of The Year, while defensive end Cole Burdette, who had 9.5 of the Yellow Jackets' league-leading 34 sacks, and helped spearhead an offense that gave up just 11.5 points per game in the regular season, was named ODAC Defensive Player of The Year. Randolph-Macon head coach Pedro Arruza, completing his thirteenth season by compiling a school record-tying nine season wins, was named ODAC Football Coach of The Year. Frederick and Burdette were also two of eight Yellow Jackets named First Team All-ODAC, along with running back/wide receiver Eric Hoy, offensive lineman Greg Castle, kicker Seth Yurgel, defensive tackle Xavier Strothers, linebacker Logan O'Neill, and defensive back Eric Long. Six Yellow Jackets earned Second Team honors, while an additional three were named to the Third Team. CLICK HERE to see the 2016 All-ODAC team in its entirety. The most successful season in over thirty years for Randolph-Macon football ended Saturday the same way it began each year from 2012 to 2015. Faced with a familiar foe, Randolph-Macon fell behind early and could not catch up as Johns Hopkins quarterback Jonathan Germano passed for four touchdowns to lead the unbeaten Blue Jays to a 42-21 victory Saturday over the Yellow Jackets in the first round of the NCAA Division III Tournament in Baltimore, Maryland. 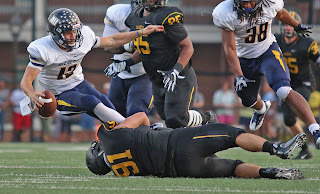 Eric Hoy rushed for two touchdowns for Randolph-Macon, who finished with a 9-2 record, their nine wins this year as many as they achieved in both 2014 and 2015 combined. It was also just the second nine-win season in school history, joining the 1984 team. CLICK HERE to listen live to 5A North Region Second Round football, as Patrick Henry travels to Massaponax! 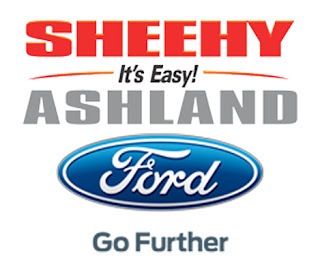 We begin at 6:30pm with the On The Sidelines PreGame Show Powered By Sheehy Ford of Ashland with Rob Witham and NBC12 Sports Director Marc Davis. The game is also on WHAN Radio, 102.9 FM, 1430 AM, and on mobile devices on the TuneIn Radio App on "Radiall"! After 8,014 days, and some individual state title winners, a team proudly wearing a Patrick Henry Patriot uniform raised a state championship trophy high above their heads. "Finally" was the Patriots own word to describe their five-set marathon win over Maury at home Tuesday night to send them to Thursday afternoon's 5A State Championship against Princess Anne, a team Patrick Henry fell to a week earlier in the Western Section Finals in five sets. But that first match did not include Patriots setter Adam Lane, who was healthy and ready, along with the rest of his teammates, as they took the court to avenge the defeat and seize a championship years in the making. A cursory look at the match statistics show a true team effort in the Patriots' three-set sweep, 25-22, 25-13, 25-22. The match was highlighted by a defensive effort, both in digging and blocking, that few teams in the Central Region have matched this season. And there may not be a better individual set played in Virginia this year than what Jarrett Carrano put together in set two, a set which saw the Patriots separate themselves from the Cavaliers in a match almost everyone expected to go the full five sets. "Jarrett's a baller," said Patrick Henry head coach Michael Townsend, who was a eighth grader sitting on the bench the last time the Patriots played for a state title, a five-set loss to Clover Hill in 2001 in the former Group AAA format. "He's 5' 11", but he will go for anything." Both schools enjoyed strong student section support, and the first set went back and forth, as everyone expected, before the Patriots pulled out the three-point win. That set the stage for both Carrano on the attack, joined defensively by Jaxon Delgado, Luke Puckett and others, to seize the momentum of the match with the second set victory. It seemed early in set three it was all but over, but the Cavaliers, a regular participant at the state championship level, had one more run in them, tying the set several times before Patrick Henry was able to get two points at the end to set off a celebration that included the paying off of a bet. "The guys told me if we won states back in August, I would have to dive on the floor and let them do the dogpile," Townsend recalled. "I had hoped they had forgotten about that, until they reminded me of it in our meeting last night." The bet was from senior Carter Riddle, who wasn't interested from the first day of practice in watching this season be a preparation for a possible state title run next year. "I have to say it. I called it first," Riddle said with a big smile during the post-game press conference. The last time that Patrick Henry won a team state championship was in football, when Ray Long's Patriots knocked off Deep Creek 21-7 at City Stadium on December 10, 1994. With all major contributors on the court other than Riddle returning next season, the Patriots may not have to wait that long again. A complete report on the Patrick Henry championship will appear in the Thanksgiving Week edition of the Herald-Progress. Patrick Henry 3, Maury 2: Patriots clinch their first bid in a state boys volleyball championship since 2001, winning 15-6 in the tiebreaker to advance to Thursday's title match, a rematch with Princess Anne, who defeated the Patriots last week in the 5A Western Section finals. Princess Anne 3, Atlee 2: The Raiders see their season come to a disappointing close, falling 17-15 in the fifth set tiebreaker. Great Bridge 3, Hanover 2: Hawks fall in the fifth set tiebreaker by a 15-12 score as the Hanover season comes to a close. Get all the details on Atlee, Patrick Henry and Hanover volleyball, plus Patrick Henry football, as postseason tournaments continue! CLICK HERE for Tournament Central at RVASportsNetwork.com ! 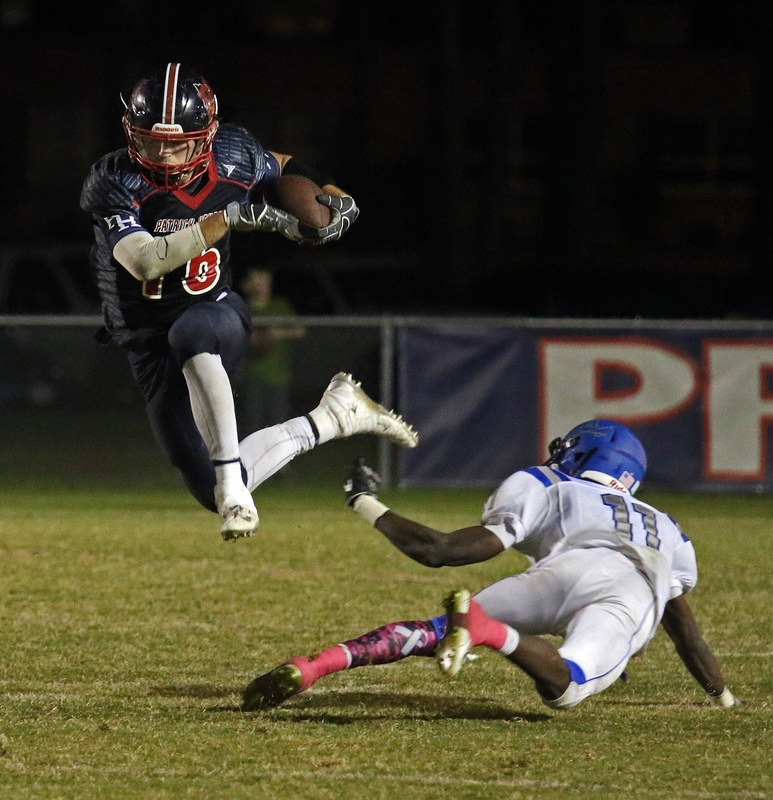 #8 Patrick Henry 53, #9 Briar Woods 28: Patriots score six second half touchdowns to win first playoff game in nine years, advance to face #1 Massaponax in second round next Friday at 7pm, a game which can be heard live on WHAN Radio and the RVA Sports Network. #3 Stone Bridge 38, #14 Atlee 10: Stone Bridge scores all 38 of their points after halftime to end the Raiders' season at 5-6. 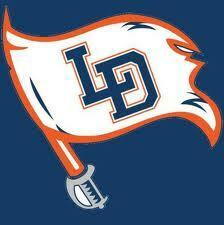 #4 Douglas Freeman 14, #5 Lee-Davis 7: Confederates struggle in the red zone, are held to one touchdown as their season comes to an end with a record of 8-3. CLICK HERE to listen live to the 5A South Region First Round matchup between #4 Douglas Freeman and #5 Lee-Davis, tonight at 6:30pm on the RVA Sports Network! Game is also available on area radio on WHAN, 102.9 FM. The 58th Tomato Bowl: #10 Lee-Davis 14, #12 Patrick Henry 7: Jamon Coffey's 85-yard kickoff return for a touchdown with 4:03 left sealed the County Championship for the Confederates, who finish 8-2. Patrick Henry finishes 7-3. Atlee 42, Armstrong 14: The Raiders, now 5-5, clinch a postseason bid in 5A North with the Senior Night victory. Henrico 49, Hanover 7: The Hawks finish 2-8, out of the playoffs for the first time since 2005. CLICK HERE to listen live to The 58th Tomato Bowl, #10 Lee-Davis (7-2) at #12 Patrick Henry (7-2), at 6:30pm on RVA Sports Network! The Tomato Bowl is also on radio on WHAN, 102.9 FM, 1430 AM, and on mobile devices on the TuneIn Radio App on "Radiall"! Listen to our postgame show tonight right after the game for first playoff projections! Armstrong (0-9) at Atlee (4-5), 7pm: Raiders need win for 5A North Region bid on Senior Night. Hanover (2-7) at Henrico (5-4), 7pm: Hawks try to play spoiler and finish regular season on two-game winning streak. The return of Tre Frederick netted big results, as the sophomore from Angier, North Carolina raced for 212 yards, while the Randolph-Macon defense held a highly regarded Washington and Lee running attack to just 213 yards, half of their season average, as the Yellow Jackets won at Lexington Saturday by a 18-10 score to draw themselves into a first place tie in the Old Dominion Athletic Conference (ODAC) with two weeks to play. 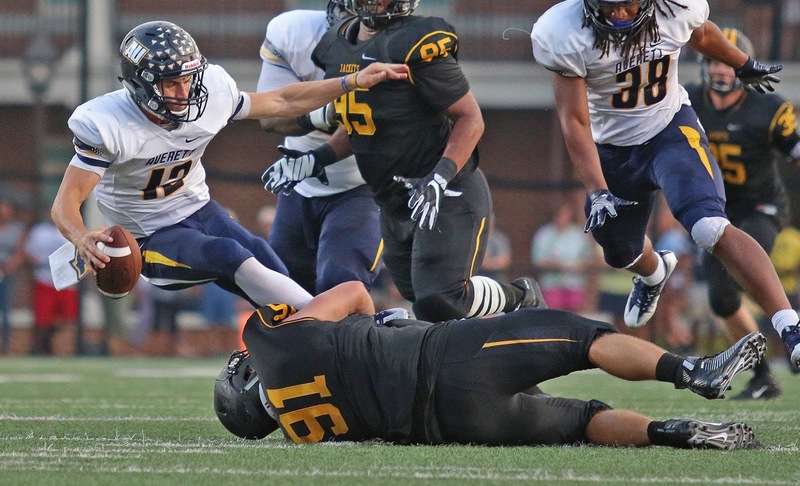 The teams traded field goals early, then quarterback Joe Vairo found Willie Schaub for a five-yard touchdown reception to give Randolph-Macon a 10-3 early in the second quarter. Seth Yurgel kicked field goals of 44 and 26 yards to up their lead to 16-3 at intermission. Senior Logan O'Neill stripped Washington & Lee quarterback Charlie Nelson in the end zone for a safety to increase the Randolph-Macon lead to 18-3 with 12:33 left. But the Generals' defense put their team right back into the game as Will Dyson picked off a Vairo pass and raced 72 yards for Washington & Lee's only touchdown of the game, cutting the deficit to eight. The Generals got the ball back with 3:34 left, drove 53 yards to the Yellow Jacket 11, only to have senior defensive back Jacob Silva (Glen Allen HS) intercept a Nelson pass in the end zone to seal the victory. Randolph-Macon, now 4-1 in ODAC play, 7-1 overall, is in a tie for first place in the conference at 4-1 with the Generals, and Shenandoah, who defeated Catholic 45-34. Randolph-Macon holds the head-to-head tiebreaker with both schools, beating the Generals Saturday, and the Hornets in their ODAC opener back on September 30th by a 24-19 count. Senior Day is next for the Yellow Jackets Saturday when always dangerous Guilford comes to Ashland. The Quakers are 1-4 in ODAC play, 4-4 overall. Kickoff time is 1pm at Day Field. Shown below are file photos of Randolph-Macon's interior defense, running back Tre Frederick (#12) talking to teammates on the bench, and Jacob Silva (#2) who had the game-clinching interception Saturday and a big interception in last week's victory over Catholic. 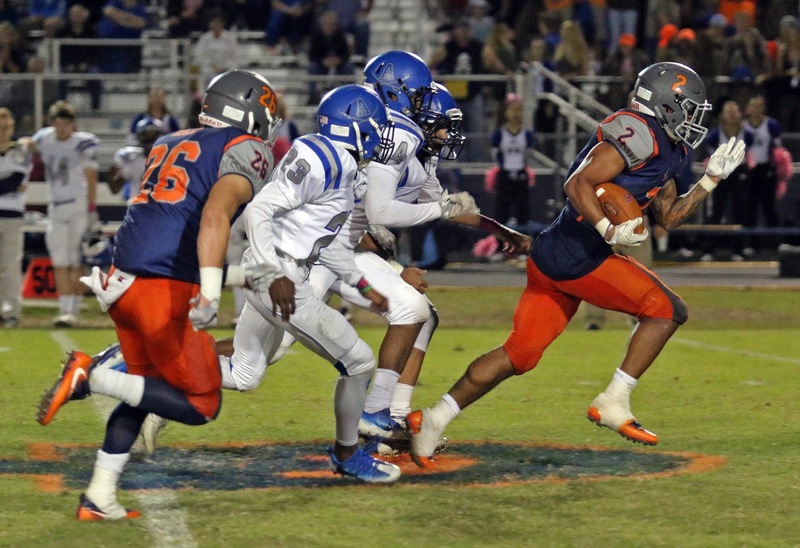 #11 Lee-Davis 24, Henrico 23: Confederates score on two fourth quarter touchdown passes, including a reception tipped to Nathan Evans for the 55-yard game winner, while Lee-Davis defense holds Henrico to a field goal late to set up the winning play. Confederates are 7-2. #4 Highland Springs 49, #9 Patrick Henry 0: Springers roll on their Senior Night as Patriots fall to 7-2, host Lee-Davis in The 58th Tomato Bowl next week LIVE on our Game of The Week. Atlee 24, #12 Varina 21: Atlee blocks a potential game-tying field goal in the final 2:30 to seal their second road win over the Blue Devils in four years, and save their playoff hopes. They host 0-9 Armstrong next week. Hanover 45, Armstrong 8: Hawks snap six-game losing streak and are victorious on Senior Night, look to play spoiler next week in regular season finale at Henrico. CLICK HERE to listen online to the Game Of The Week, as Henrico (5-3) and #11 Lee-Davis (6-2) battle for playoff positioning in 5A South! We go live at 6:30pm with the "On The Sidelines Pre-Game Show Powered By Sheehy Ford of Ashland" with Rob Witham and Marc Davis of NBC 12! You can also listen on WHAN Radio, 102.9 FM and 1430 AM! 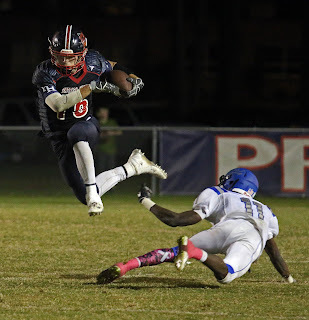 #10 Patrick Henry 26, Atlee 14: Patriots defeat the Raiders for the first time since 2008 as Hunter Hart accounts for 277 yards of total offense, has an interception, and scored three rushing touchdowns. 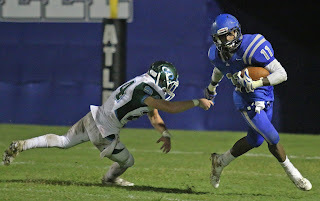 Clifton Woody had a 93-yard touchdown run for Atlee, now 3-5. Patrick Henry is 7-1. Lee-Davis 69, Hanover 31: Four touchdown passes for Zach Lass, five total touchdowns by Nathan Evans as Lee-Davis moves to 6-2, while Hanover falls to 1-7. GAME OF THE WEEK: Henrico (5-3) at Lee-Davis (6-2), on WHAN, 102.9 FM/1430 AM, online at this website and on TuneIn Radio App on "Radiall"!